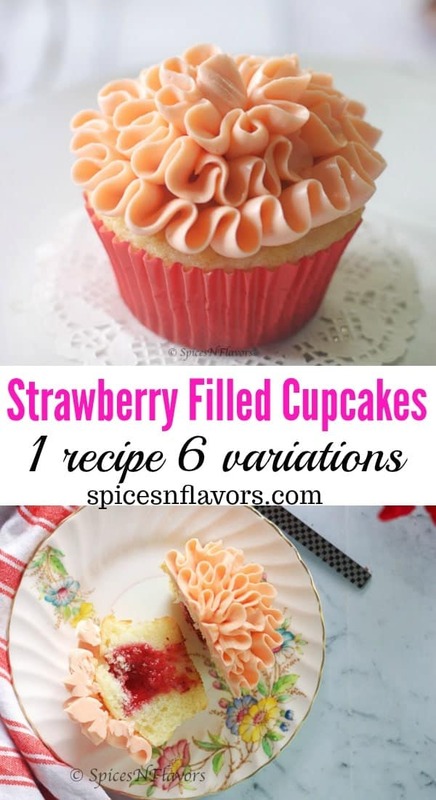 Soft and Moist Vanilla Cupcakes with delicious juicy strawberry filling and a silky, smooth, creamy frosting with a beautiful pattern – these Strawberry Filled Cupcakes are to die for!!! What’s your favourite type of cupcake? Must be pleasing to the eyes – We eat with our eyes right!! The flavour should absolutely shine through. Frosting must not be too little or too much and must not be too sweet. Sigh!! Now that’s a lot of criteria. But trust me these vanilla cupcakes with strawberry filling absolutely ticks all the boxes!! And since it is Valentine’s now you can also choose to make chocolate cupcakes with strawberry filling. One flavour that never fails to impress!! There is something about strawberries that just screams LOVE. Don’t you all agree? Be it plain strawberries, strawberries dipped in chocolates, strawberries with whipped cream or strawberry filling used in various recipes – simple to complex recipe, strawberries just pair up so well with all types of other flavours too right!! And How do you make a strawberry filling? All you have to do to make this delicious juicy perfectly sweetened strawberry filling with a hint of tartness is to simply combine some fresh or frozen strawberries along with sugar, a dash of lemon juice and cornstarch. Mix everything together until you the strawberries soften, sugar dissolves, everything comes together and is thickened a bit. Cool completely and there you have it your homemade strawberry compote filling for cupcakes. There are so many variations that you can make once you master a single recipe like this. For eg: Take today’s recipe: Strawberry Filled Cupcakes – It’s a simple vanilla cupcake filled with strawberry filling. 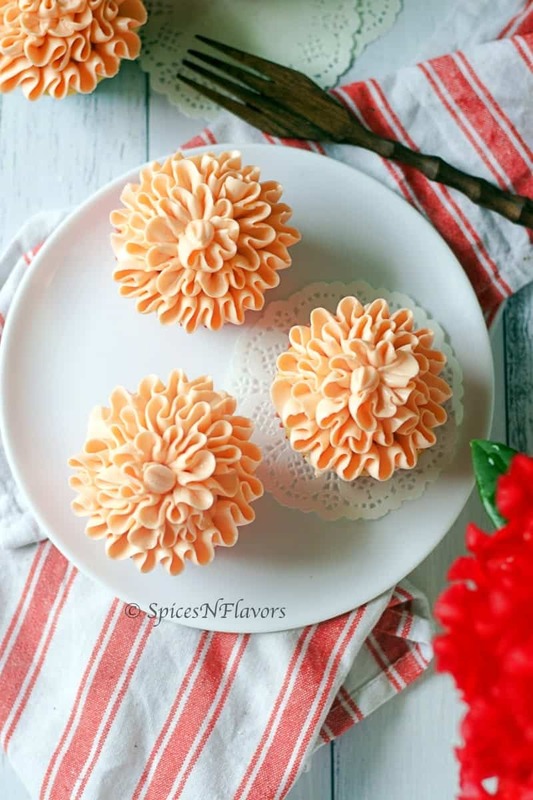 Next thing you can make is Strawberries and Cream Cupcakes – Instead of buttercream frosting, you can choose to make Stabilized Whipped Cream frosting to frost the cupcakes. 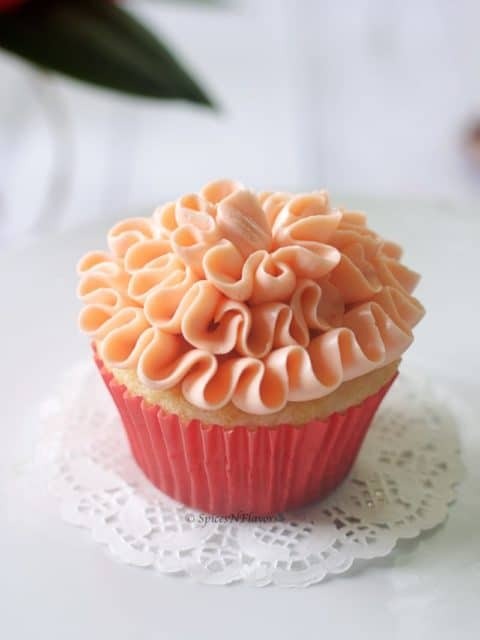 Make strawberry cupcake by adding the prepared strawberry filling into the cupcake batter and then frost with Whipped Cream Frosting. Strawberry Cupcakes with strawberry filling sounds so heavenly!! OR maybe make a fresh strawberry filled cupcakes. Imagine a whole juicy ripe strawberry sitting right in the centre of a vanilla or chocolate cupcake. I would be totally surprised to have these cupcakes. 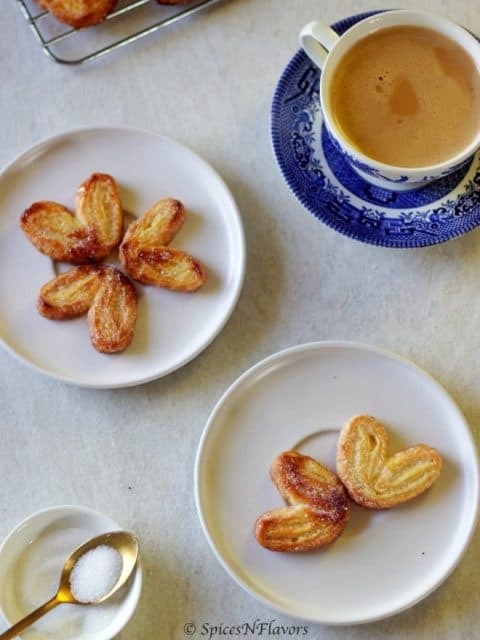 Indeed won’t it be a great way to surprise your foodie lover with such a simple idea? Let me take a minute here and tell you if you do not have the time to make these cupcakes then I have a perfect list of 11 dessert recipes for Valentine’s that you can make in 10 mins; definitely check that. Make a Strawberry Stuffed cupcakes or take a further step to make the easy strawberry filling for cupcakes, your partner in crime would be totally taken aback when he/she bites into the surprise filling. 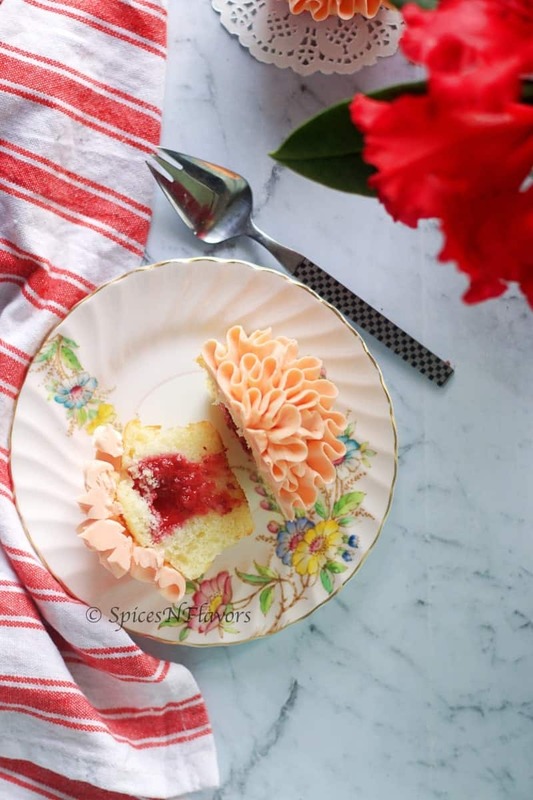 Strawberry Shortcake Cupcakes: Again this is just another name for our Strawberries and Cream Cupcakes but in this case instead of preparing our own Strawberry filling we can use strawberry jam and add few chopped strawberries to it. Strawberry jam filled cupcakes and frosted with whipped cream is known as Strawberry Shortcake Cupcakes. That’s so cool right – just using two easy recipes 1. Vanilla Cupcakes and 2. easy strawberry filling for cupcakes we can create so many variations and each time it would have a different mouthfeel all together. Apart from the perfect flavour, the other thing that I absolutely loved about these strawberry vanilla cupcakes is that gorgeous frosting deco on top which is so pleasing and soothing to the eyes. 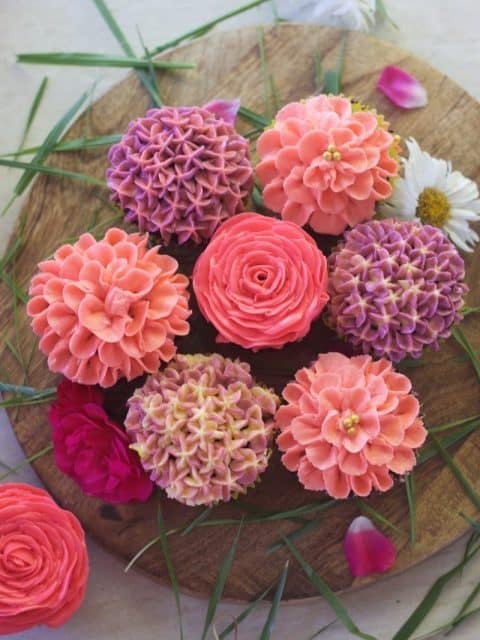 How to make Ruffle Pattern Cupcakes? And a steady movement of your hands to create this beautiful looking pattern on top. So just go ahead and make any frosting of your choice. 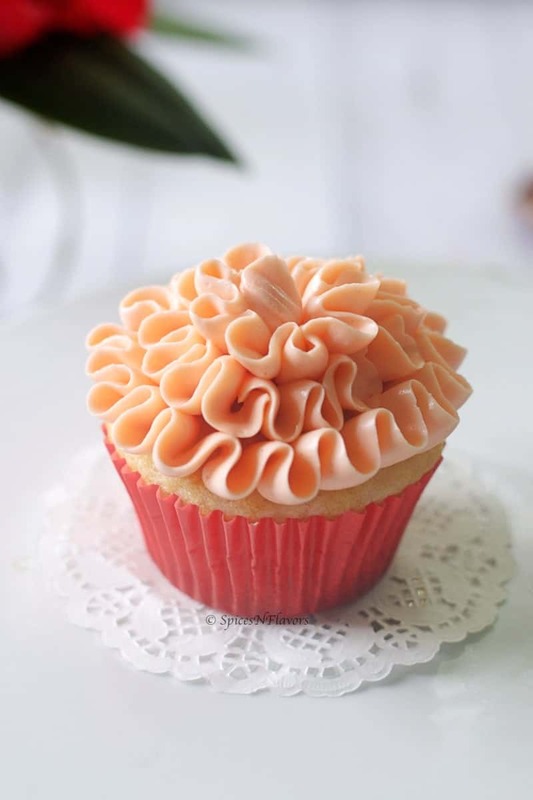 I have made this Strawberry Buttercream Frosting using the recipe that I had discussed in our Buttercream 101 – Everything you need to know post. Fill your piping bag with the frosting with tip 104. Place the cupcake on your rotating cake stand. Keeping the tapered end of the tip facing the cupcake and the broad end facing outwards start piping on the cupcake in forwards and backwards direction. So with one hand, you pipe the frosting too and fro and with the other hand rotate the cake stand so you get the frosting rolling out in one particular direction. By the way, guys if you would like to see any other type of cupcake decorating ideas do comment below so that I can come up with an entire post on different ways to pipe or decorate a cupcake. What if you do not have a cake stand? In that case, directly rotate the cupcake with your other hand to keep the continuous motion ongoing. Even if you make a mistake while making this pattern it won’t show up. That’s another big plus of using this pattern. Only thing when you reach the inner circle take care to count and make the pattern so as to make a tip in the centre. How to make Strawberry Filled Cupcakes? Soft and Moist Vanilla Cupcakes with delicious juicy strawberry filling and a silky, smooth, creamy frosting with a beautiful pattern - these Strawberry Filled Cupcakes are to die for!!! Add vinegar to the warm milk and allow it to sit for 5 mins. This is our homemade buttermilk recipe. Meanwhile sift together your dry ingredients - Flour, Sugar, Salt and Baking soda. Once sifted add all the wet ingredients one by one. Oil, Essence and homemade Buttermilk. Combine to a cake batter like consistency. Divide evenly in between the muffin tins that have been pre-lined with cupcake liners. Wipe off any drips and then bake in a preheated oven of 180°C for 15-18 mins or until a skewer inserted in the centre comes out clean. Take everything mentioned - Strawberries, Sugar, Lemon juice and cornflour in a saucepan. Mix everything and heat on medium flame and combine until the strawberries are softened, sugar is melted and everything comes together and thickens. Transfer to a container, cling wrap and all it to cool completely. 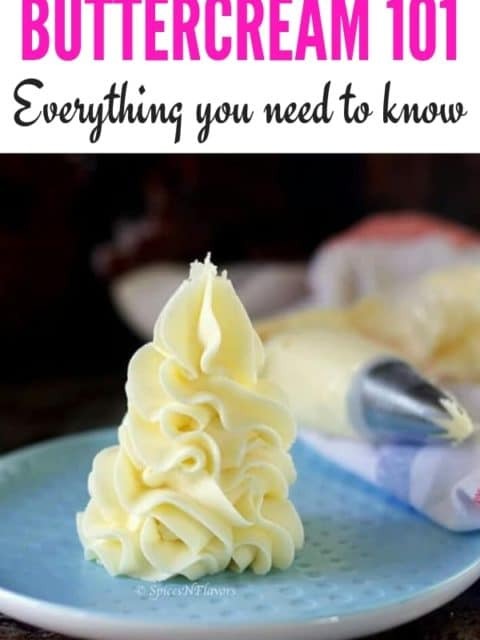 Click here for the detailed step by step recipe on Buttercream frosting or simply refer the video. 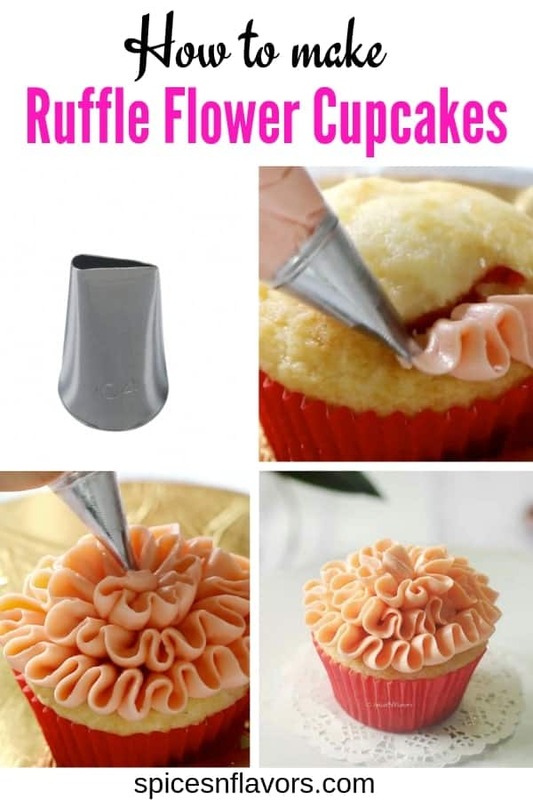 Once the cupcakes are cooled, using a knife just remove the centre portion. Do not cut it deep inside or else it will fall apart into two. Add the strawberry filling in the centre and put back the cutout centre portion on top of the filling to seal it. Today I have made strawberry filling for cupcakes using frozen strawberries. However, you can also use fresh strawberries to make this recipe. Instead of vanilla cupcakes, one can also make Strawberry Cupcakes or Chocolate Cupcakes. The frosting recipe mentioned above just covers 7 cupcakes with ruffle pattern. The recipe can be easily doubled to cover the entire batch of cupcakes. I hope you guys liked today’s recipe and I believe here on you won’t wonder on What do I make with strawberries? If you liked today’s recipe or would like to share your thoughts with me in general then definitely drop a hello on my Facebook, Twitter or Insta page.